In a likely "buy the rumor, sell the news" scenario, Apple's stock is down in an up market today, after the new iPad announcement. The drop passed 1% at the time of writing this, so we are curious about the close and the next few days. Apple's shares had a great runup until the announcement and speculators are probably getting out in droves now, cashing in on handsome profit margins, especially if they bought options a month or so ago. The fruit company is with the largest market cap, and just rumors about the NASDAQ rebalancing its weight in the index brought the shares down recently. Not to mention how many investors - from pension to hedge funds - are loaded on Apple shares, so any significant movement down always brings a big kerfuffle with it. A similar drop occurred after the iPhone 4S announcement, but Apple proved the underwhelmed investors wrong by still selling a record amount of its new phones in the next months. The iPad will still be a major seller and market leader so shares won't fall much but it is clear that this has not been a year of Apple staying far ahead of the competition for hardware innovation. The Apple TV part was the biggest letdown. I think rumors of an actual TV will now be put to rest for a while and the new model adding 1080p brings it current with 5 year old displays. If a TV was coming shortly, Apple would have updated the box for that event. The iPad will still hold its own for the next year, though with the thicker, heavier design, similar resolution to 1080p tablets, and other slightly refreshed specs, Apple has not revolutionized anything this time. 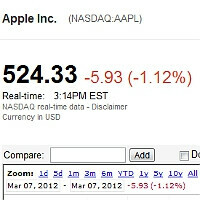 rather have that than a success that doesnt sell..
Apple will probably sue Samsung over the drop in share value. Didn't I tell you? The bigger they are..
Go play with your iPad 3. iMean iPad.... sorry. iAm going to thumbs you up', just to show how magnaniMous iCan be. agreed. You guys are pathetic. Im a teen and i dont even do this. You guys are way older and acting like little brats. LOLOLOLOLOLLOLOOLOLOLOLOLOLOLOLLOOLLO! So even iDrones aren't retarded enough to see the value in buying the ipad2 again with a high def screen. Maybe they're evolving. to iCows. And here comes the Lord of the iDiots right on cue! He will show us the true meaning of idiocy!